In 1928, at the age of nineteen, college student August Derleth wrote to Sir Arthur Conan Doyle, asking him whether he planned to produce more Sherlock Holmes stories, and announcing that, if Sir Arthur did not, he, Derleth, would begin a series of pastiches of his own. Sir Arthur promised nothing, and Derleth went ahead, creating Solar Pons. Between Pons’ first published appearance in 1929 until Derleth’s death in 1971, the bite of the Sherlockian bug prompted him to write more than seventy Solar Pons adventures in the best Holmes tradition. Throughout, he devoted endless hours to research and authentication of details into recreating the London milieu of Pons. 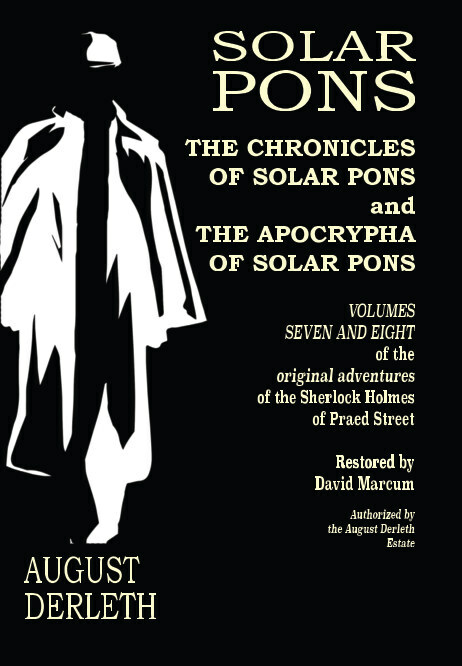 Now, restored from the original 1973 Mycroft and Moran edition, Solar Pons is back! Join Pons and Dr. Parker in The Chronicles of Solar Pons as they investigate the terrifying events of “The Missing Tenants”, the suspenseful matter of “The Orient Express”, and the nearly perfect adventure of “The Unique Dickensians”. For many years, it was believed the Pontine Canon would end with the publication of The Chronicles of Solar Pons in 1973. But over the years, additional material was discovered in various places, including obscure publications and Derleth’s own files. Now, thanks to Derleth’s heirs and the August Derleth Estate, which still retains full ownership of Solar Pons and these apocryphal adventures, this new easily available and affordable collection has been made possible. Once again, the game is afoot!